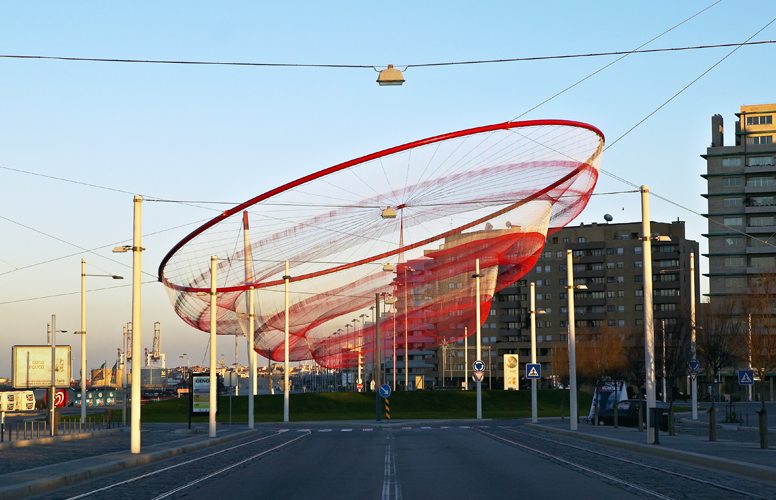 The Janet Echelman’s sculpture in Porto, Portugal, created in 2005. I wrote about it in my article “Arhitekt u Portu” (“Architect in Porto”), published in 2010 in our local architectural magazine Prostor-S from Banjaluka. Officially entitled “She changes”, the sculpture is known as The Sea Anemone among Portans. The city authorities invited the American artist to create a contemporary symbol of Porto. 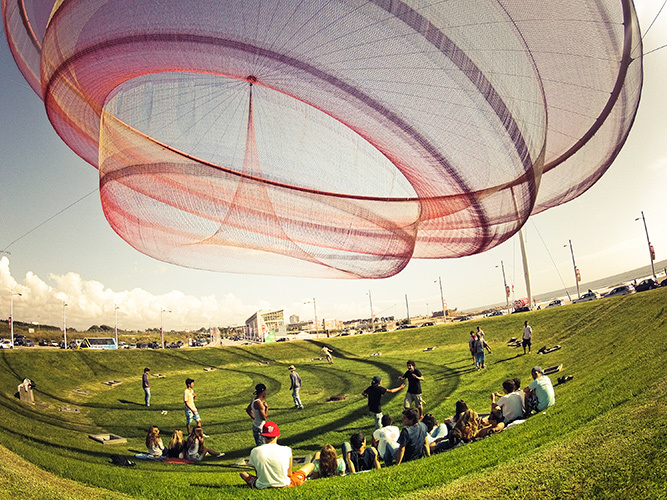 The large structure (about 50x50x150 m) is situated at the waterfront location in Matosinhos. The sculpture is intended to be in constant dialogue with the forces of nature, which is the artist’s general theme of interest. Besides, the anemone is a reflection to the local identity and history, expressed by means of contemporary art. The structure consists of the steel ring suspended from the three steel poles, and a system of steel membranes of various densities. The most direct association is thus to the fishing nets – the basic tool used in one of the key economy branches of an oceanfront city. The sculpture has not only been appreciated and awarded in artistic circles, but also accepted well among common people, who have a number of their own associations and interpretations of the artwork: it often reminds them of the traditional lace, ocean waves or various sea creatures. The refined artistic concept was united with the position, dimensions and materials well-thought out: those were the necessary conditions to make it a successful intervention in the public space. The work is a powerful and recognizable magnet, at the same time subtle enough not to obstruct views towards the Atlantic. Actually, the context created by water, wind and light enables the meaning of the sculpture to be fully expressed. It’s important to know that a number of architects and engineer have worked with the artist to make the work possible, and their budget was about 1.25 million euros.